Leroy Merlin pays homage to all those who dare to launch their home project farther, in one of its latest commercials, titled “Life’s Adventure”. The spot, created by agency Betch Shopper and directed by Reynald Gresset, features a young couple who have bought an old ramshackle house, situated in a wonderful place, on a cliff, with sea view. The two lovers embark then on the hard, but beautiful mission to turn that house into the house of their dreams. Thus, they begin demolishing what is no longer of use, removing the old wallpaper, and starting to make everything how they wish. Of course, it is a long process, paved not only with joyful moments, but also with difficult times. 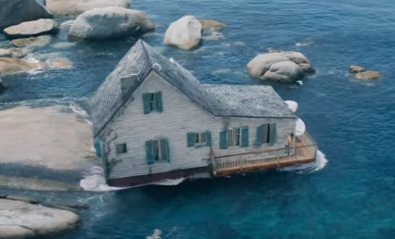 Set to the rhythms of a cover performed by Ana Zimmer of Red Stewart’s 1975 single “I Am Sailing”, the ad follows the couple and their house, which at the beginning comes away from the ground and floats on the sea, through good and bad weather, and chronicles all the joyful and tense moments, as fights between the two are a part of everyday life, as well. All their life’s adventures – simply said.